Mt. 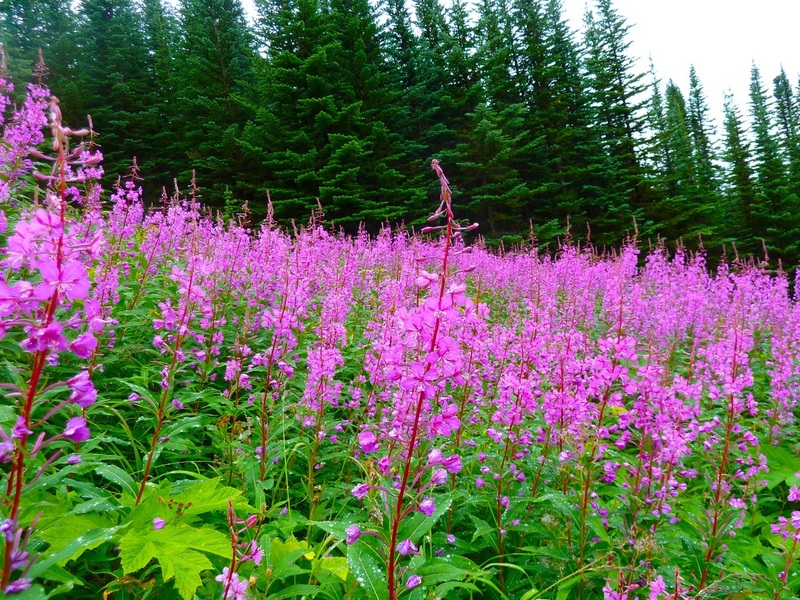 Edziza Park in northwestern B.C. is vast, remote and mystical. It’s a place we’d often dreamed of exploring and finally made happen. 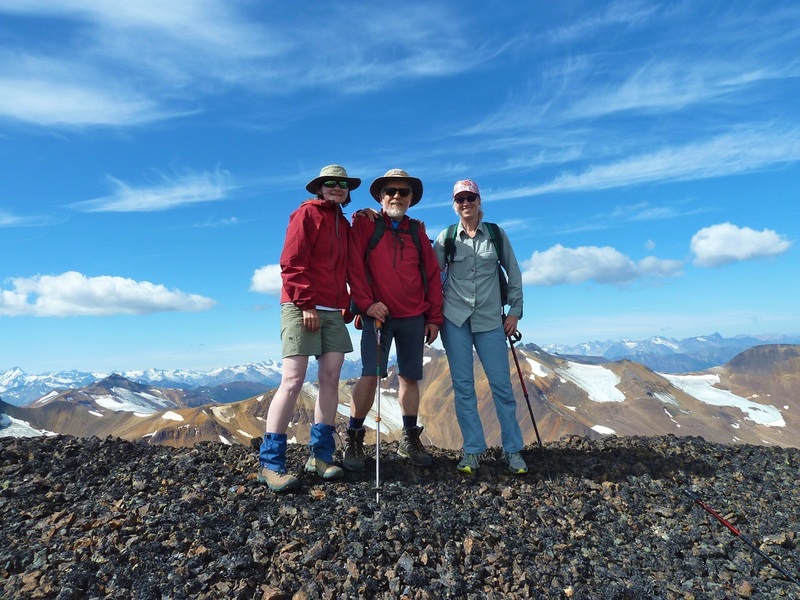 We spent multiple days connecting with nature in a treeless landscape of alpine meadows dotted with sparkling aquamarine tarns and surrounded by steep and towering orange-red volcanic peaks and ridges. We were granted all the space and peace and beauty we could embrace. The two-day drive north under sunny skies took us through scenery that was familiar and dear to me the further north we got. At the Kitwanga gas station we turned onto the Stewart-Cassiar Highway. 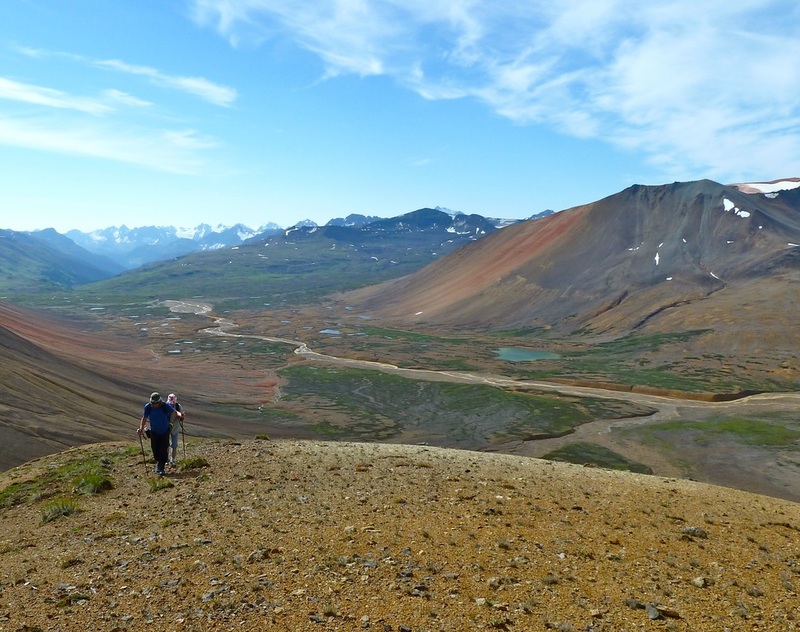 The clear day offered up magnificent peaks, glaciers and fast-running silted rivers. We took the opportunity the next day to visit Salmon Glacier (along with numerous other tourists!) and chanced upon a roadside trail that led us on a 4 hour hike into alpine meadows bursting with colour and to a second glacier – far above all the tourists! A number of helicopters were flying back and forth to install a power line for the new gold and copper mines. 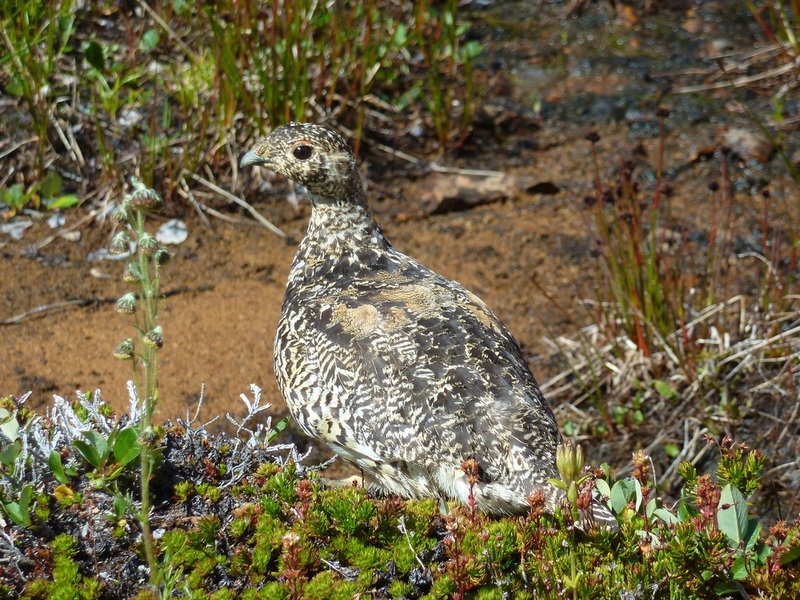 This was a stark reminder that the northwest wilderness is now open to development and will never be the same. We ended the day with a refreshing swim (yes, even Henning) in glacier-fed Clements Lake where we were camped. The following morning Henning called out to me “There are mice in our bag!” I didn’t think I’d heard correctly, until Henning dumped 5-6 mice, along with our clothes, onto the picnic table. 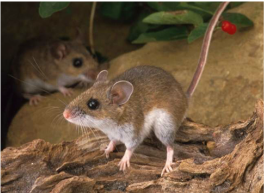 They were deer mice, cute really, that had somehow jumped into the jeep and found a cozy place to nest. They were not so cute anymore when I discovered that they’d also nibbled on our trail mix! 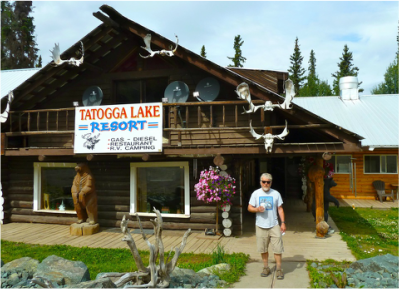 We got to Tatogga Resort, a rustic peaceful place, a day before our scheduled float plane departure. Despite the cold and the rain, we embarked on a hike into the alpine with sweeping views of sheep inhabited valleys. 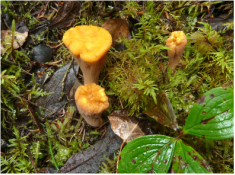 The forest sported thick, luxuriant moss and mushrooms of all sizes and shapes and colours- a mycologist’s dream. 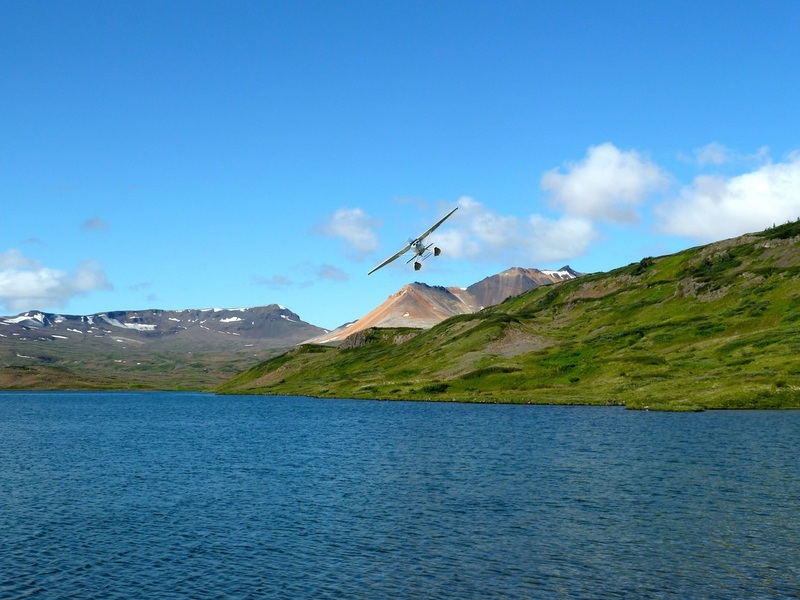 It seemed that luck was with us, because we awoke to clear blue skies – perfect for our flight into Little Ball Lake. The butterflies in my stomach soon dissolved into excitement once we were soaring over spectacular peaks and alpine meadows punctuated by glistening tarns. As we waved to the departing floatplane (which would pick us up in 5 days), and let the stillness sink in, we were filled with euphoria: just the four of us (Catharine and Dan had met up with us at the resort), and these wild expansive vistas. We walked a little over 2 hours captivated by the luminescent orange peaks and ridges, and forded icy Bell River before setting up camp beside a clear, shallow lake. I was relieved to have such a short day, because my 30lb pack was feeling heavy. Our tents were dwarfed by the surrounding peaks, and we, likewise, felt diminutive and in awe of our environs. peaks, snowfields, and the distant snow-covered Coast Mountains. 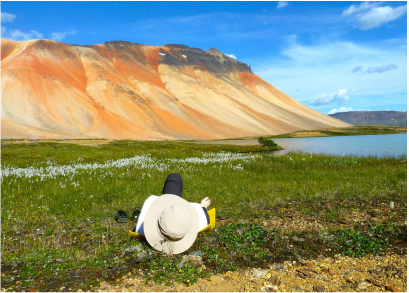 On our third hot and sunny day, we broke camp for a 14 km trek to Little Arctic Lake. Fortunately my pack was already considerably lighter. We descended into at least two small canyons that stood in our path. It was a little dicey, given our heavy packs and the steep-sided walls of loose rock, but luckily no one slipped. 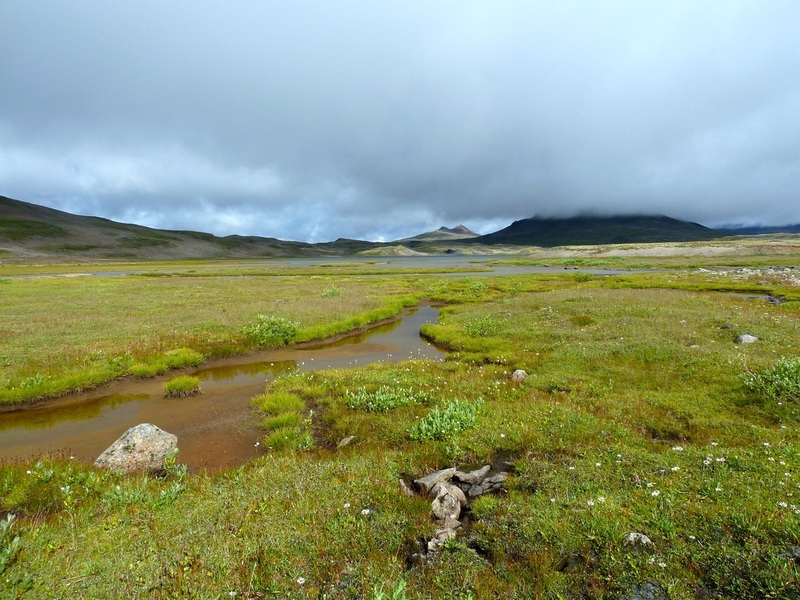 Our second camp was on mossy, hillocky terrain, next to a small meandering stream. It was magical in the evening sun. Though still surrounded by volcanic peaks and ridges, they were becoming more distant. Moose and wolf tracks were in the vicinity, but neither animal was seen. Low cloud moved in overnight. 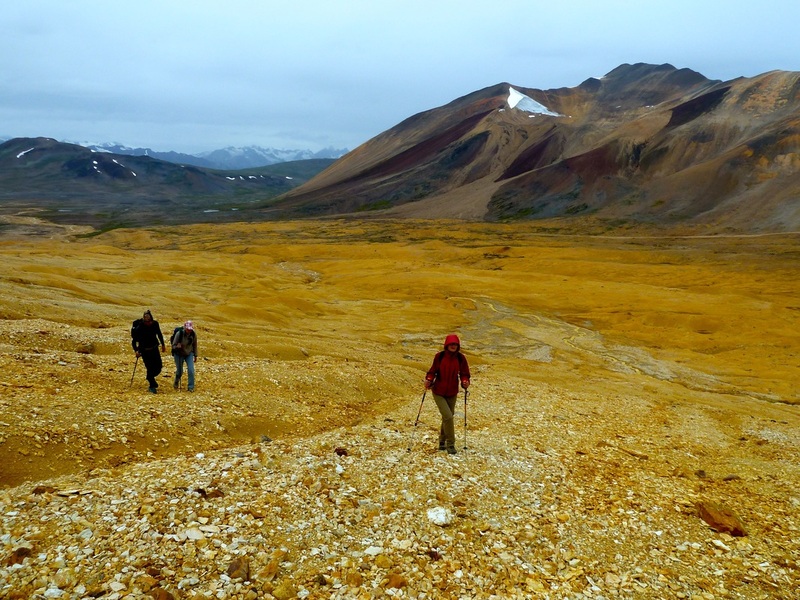 We opted to day hike across a substantial field – part boulder-strewn, part flat rock slabs that sounded like walking on glass, part glacial silt and mud that we sank into – to look for a pass (shorter route) back to the valley we’d come from. We climbed uphill next to a massive glacier and were rewarded at the top with a view of the lake we’d camped at on our first day. It started to rain in earnest and the wind was fierce for the return trip. Having walked 18 km, cold and wet, we huddled under the tarp Henning erected, supped and were early to bed. As we packed up the next morning for our walk to Arctic Lake, sunrays peaked through the clouds to lift our spirits. We stayed dry, but the cold wind persisted as we left the orange peaks and ridges of the Spectrum Range behind us. And it blew across Arctic Lake too, creating frenzied whitecaps. Henning found us a sheltered kitchen area where we had a relaxing evening in the sun next to a serene alpine delta. We glimpsed the Northern Lights as they were already beginning to fade just before dawn, and awoke to 5°C. I wore everything warm that I had. The cloud ceiling was high, but grey clouds on the horizon prompted us to conserve our food and eat only half our breakfast in the event the plane wouldn't be able to land. We were packed and ready for pick up by 10 am. But then the rain started and the mountain peaks began to disappear. We sheltered under the tarp Dan and Catharine had wisely left up, but by noon we were convinced the plane wasn’t coming today. And yet we’d just got to the beach to retrieve our packs to set up camp again when a plane miraculously appeared out of the clouds. We all cheered, but the pilot urged us to hurry. We only had a very small window to get out – there was already only a 50% chance. We had to wade into the frigid water to load our gear and push the plane into deeper water until it was floating. The pilot moved from one opening in the clouds to another, keeping us away from mountain peaks, and scanning the horizon for possible emergency landings. We were thankful to land safely on Tatogga Lake. Cold, wet and hungry, yet exhilarated, we headed straight to Tatogga Lodge for a hearty tasty lunch. We spent a cozy night in a wood stove heated log cabin, listening to the pitter patter of rain on the roof. The next morning we drove north to Dease Lake and then 2.5 hours on 112 km of dirt road (mud road due to the night's rain). The road meandered along the Tahltan and Stikine Rivers, which carve into the Grand Canyon of the Stikine. We visited the ghost town of Telegraph Creek, quiet in the absence of tourists, and envisioned the days of the gold rush and laying of the telegraph line.